A Culinary Agents' Career Page makes it easy for employers to syndicate the jobs already posted on CulinaryAgents.com to your website with just one line of HTML code. (For more about the benefits of adding jobs to your website, please read 5 Ways a Career Pages Enhances Your Employer Brand). Create your free user account on CulinaryAgents.com (click the link in the confirmation email). Add your business by signing into your account and clicking on your Profile Icon, then "Add a Business." Note: You do not need active jobs to add a Career Page to your site. Any jobs you post in the future on CulinaryAgents.com will syndicate to your site as well. Review the design of your Career Page widget. If necessary, customize the design by specifying the background, link color, button color, or the theme of the "powered by Culinary Agents" logo. 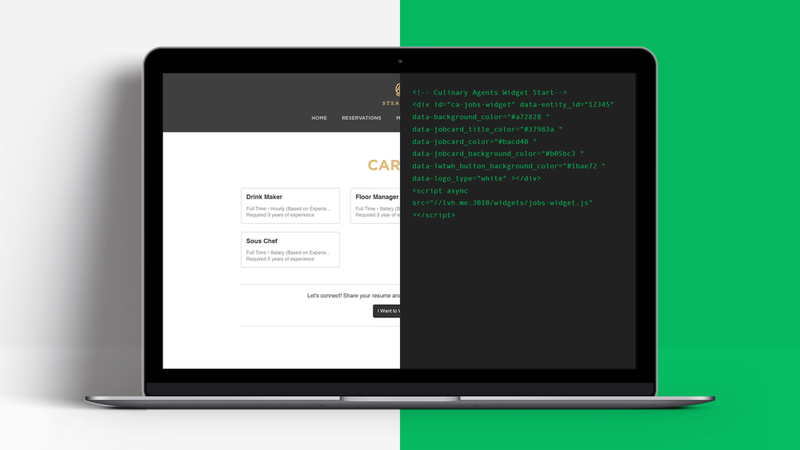 Click Add Jobs to Site, then copy-and-paste the code into the HTML of your site. Paste the code within the <body> of your HTML page.